myhr.cvs.com is an employee benefits portal for current and former CVS Health and MinuteClinic employees. In order to prevent phishing attacks and avoid identity theft, make sure that you are accessing CVS HR on https://beplb01.portal.hewitt.com/web/cvscaremark/welcome?forkPage=false web page. Avoid clicking URLs in your e-mail or on web pages. It is typically much safer to type URL yourself into browser address bar. You can just type http://myhr.cvs.com and it will redirect you to the right CVS HR login page. If you’re not sure if the site that you navigated to is CVS HR benefits portal, you can check its SSL certificate and verify with the one that we got below. 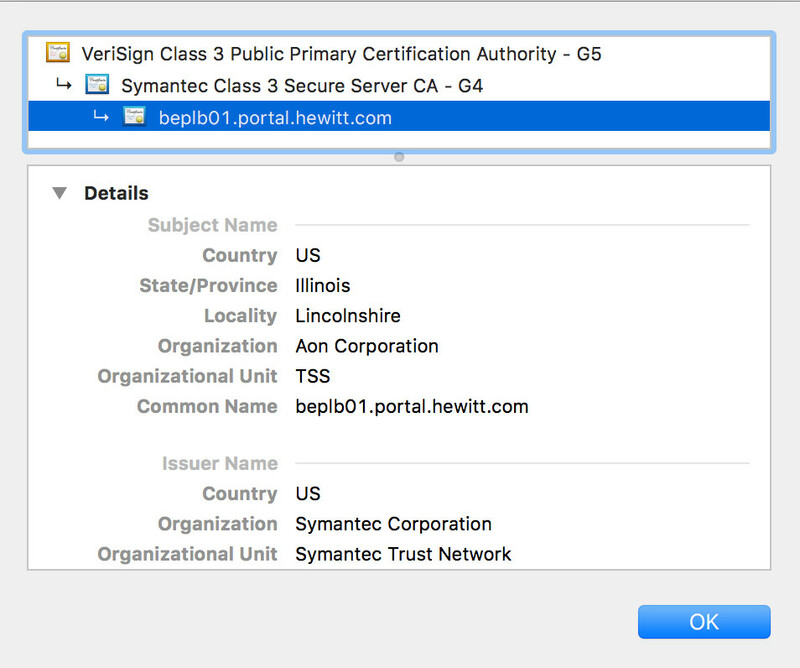 By verifying SSL certificate you can avoid a significant number of phishing attacks (though not 100%). MyHR CVS Portal is an extranet HR portal for current and former CVS Pharmacy employees. CVS Pharmacy employees can use this portal to access and manage their CVS Health benefits. This quick guide will cover important details on how to login to this portal in a safe and secure way and will also provide links and information necessary to get customer support for CVS MyHR portal. In order to login, you need to supply your user ID and password. If you’re a new user you need to create your User ID by clicking on “Are You a New User?” link. As part of the new user registration process, you will also create your password. Make sure to keep your User ID and password in a confidential place. If you suspect that your password could be compromised you need to notify CVS Caremark or myHR immediately. Also please note that User ID is not case sensitive so it is ok to use both uppercase and lowercase letters when typing it. During the registration process you will also create your password hint. This hint will help you remember your password in case you forget it. Type your User ID into User ID input box. Type your password into Password input box. Click on “Log On” button. If your password is not working on the login page make sure that your Caps Lock button is turned off and you are typing letters in the correct case in the password field. If you forgot your password you can see your password hint which will help you to remember your password. If this doesn’t help you need to reset your password by clicking on “Forgot password” button on the login page. You can also get an access code to access My HR CVS portal via e-mail, text message or mail. Call myHR at 1-888-694-7287 (888-myHR-CVS) – For Health and Welfare, Press 2. between 8:00 a.m. and 8:00 p.m. Eastern time, Monday through Friday.